Two-time Wimbledon champion Rafael Nadal has insisted that his shock Wimbledon exit to Lukas Rosol is not 'a tragedy'. The Spanish second seed succumbed to his equal earliest exit at the All England Club as the world No 100 Czech Republic player dumped the two-time SW19 champion out in a stunning five-set second round victory. The 2,500-1 pre-tournament outsider won 6-7, 6-4, 6-4, 2-6, 6-4, with the final set played under the roof on Centre Court. 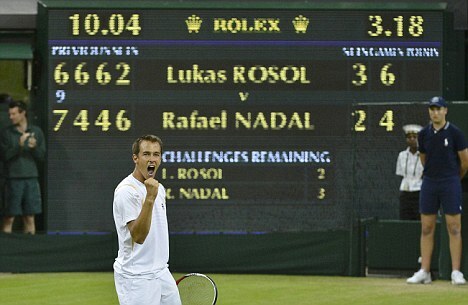 Big-serving Rosol was playing on grass for only the second time in his career and can now looks forward to facing German Philipp Kohlschreiber in the third round on Saturday. 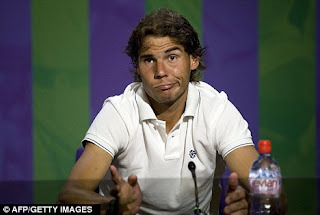 The 26-year-old hailed his win as a 'miracle', while Nadal's legion of fans took to Twitter to lament his shock defeat. The world No 2 admitted he was looking forward to returning to his native Spain for a break before returning to Wimbledon next month for the London 2012 Olympics.